Embrace the "new normal," become knowledge brokers and communicate how the transportation industry benefits society: these are key ways transportation leaders believe the industry can change how it does business. As public and private players strive to meet the challenges of aging highway systems, growing congestion and limited resources, some are exploring transformational change inside their organizations. Speakers at a Highways for LIFE workshop at the 90th Annual Meeting of the Transportation Research Board in Washington, D.C., discussed what the industry can do—and is doing—to change strategic direction. Cultural and demographic events have created a "new normal," according to Minnesota Department of Transportation Commissioner Thomas Sorel, one that includes slower economic growth, a more diverse population and uncertainty about the future. "We shouldn't fear this because it plays to our strengths," Sorel said, such as depending on increasing productivity rather than the size of the labor force. "Growth in efficiencies, accountability and transparency are critical parts of responding to the new normal." The Minnesota DOT responded by developing a sustainability policy that addresses societal, economic and environmental issues and adopting a risk management approach to delivering transportation programs. It surveyed Minnesotans on what quality of life means to them and how transportation influences it. "We listen to our customers and try to figure out what they value," Sorel said. Organizational congruency is essential to delivering transportation services effectively, Sorel said. "There needs to be alignment in the vision our external stakeholders see and our behavior, so we've been very clear about our vision, our mission and our strategic direction," he said. "We put the citizens of Minnesota at the top of our organizational structure because we serve them." The Federal Highway Administration is becoming a culture of innovation, said FHWA Administrator Victor Mendez. "We're changing the way we move ideas throughout our agency and get them out to state and local agencies and the private sector," he said. FHWA is doing it through Every Day Counts, an initiative aimed at shortening project delivery time and accelerating deployment of new technologies. As part of the initiative, FHWA held innovation summits to engage transportation stakeholders across the country and is encouraging development of state-specific plans to implement key technologies to enhance safety and reduce congestion. The goal is for FHWA staff to be knowledge brokers who add value by bringing new ideas to the table. "I've encouraged our people to couple that with a new way of thinking we call 'leaning forward,'" Mendez said, which he described as being a waiter who not only presents the menu but makes recommendations and seeks feedback. "We're advocates for innovation." Mendez said he is encouraged by the positive response to the Every Day Counts initiative. "I sense that people are thinking it's really time for us to look at a new way of doing business," he said. "We're accountable to the American people, and they want everything to be done faster, smarter and better." Transportation professionals in both the public and private sectors need to do a better job of speaking up about the positive impacts the industry's work has on society, said Dr. T. Peter Ruane, president and chief executive officer of the American Road & Transportation Builders Association. "We are not doing enough to celebrate examples of innovation and accomplishment to engender public support for what we do," Ruane said. As a result, the industry has an image of being conservative and reluctant to try new ways, despite significant change and innovation over the past two decades. "It's imperative that the engineering community assume responsibility for communicating the benefits, the breakthroughs and the uniqueness of its efforts to legislators, the public and the media," he told workshop participants. "My challenge to you is to tell the story that needs to be told. If we don't, no one else will." The transportation industry has changed in many ways over the years, such as moving from a highway to a multimodal focus and making the environment a priority, said Hal Kassoff, senior vice president at Parsons Brinckerhoff. "But we still have a lot of room for improvement," he said. Changes the industry needs to work on include delivering projects faster, providing more value for the dollar and expanding revenue sources, Kassoff said. The way to do it is by reinvigorating industry organizations, many of which have roots that go back a century or more. That calls for leadership that is both inspired and inspiring, that engages both internal and external stakeholders. "You can be a leader if you're a first-line employee or at the top," he said. It also requires integrative management that recognizes that diversity and different viewpoints are useful, he said, and it needs a culture in which innovation is not just allowed, but celebrated from the front office to the front lines. "Reinvigorating our organizations can lead to the resources that we need to bring about better change for our customers," Kassoff said. It was the longest two-span bridge ever moved by self-propelled modular transporters in the Western Hemisphere and everyone was invited to watch. More than 1,200 spectators, many toting chairs and blankets, turned out for the successful five-hour move of the Sam White Bridge over Interstate 15 in American Fork, Utah, on a chilly Saturday night in March. They watched as two sets of SPMTs—computer-controlled platform vehicles that move heavy loads with precision—lifted the 354-foot (108-meter) structure 21 feet (6.4 meters) in the air. The SPMTs moved the bridge from where it was built on the east side of I-15 across eight freeway lanes. Despite early morning snow showers, crews set the bridge into place about 4 a.m. Sunday and reopened the freeway at 7 a.m., three hours ahead of schedule. "The Sam White Bridge move demonstrates our commitment to employing the latest technology to minimize delays to the traveling public and delivering our projects as fast as possible," said John Njord, executive director of the Utah Department of Transportation. 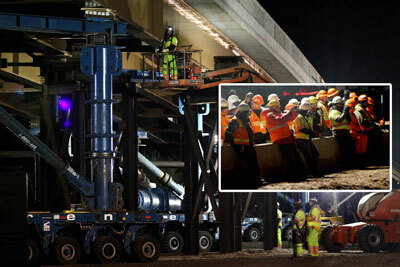 Crews used SPMTs to move the Sam White Bridge into place over I-15 in Utah in just five hours. (Inset)Transportation professionals watched the overnight bridge move and attended a workshop the next day to learn how it was done. Among those who observed the historic event were about 200 transportation professionals from 13 state highway agencies, contracting firms, universities, European organizations and the Federal Highway Administration. Utah DOT and FHWA sponsored a workshop the next day featuring presentations on the engineering and technical details of the move and how to incorporate accelerated bridge construction technology into transportation programs. The bridge is part of Utah's 1-15 Corridor Expansion project, known as I-15 CORE. The $1.7 billion design-build project, one of the largest roadway projects under construction in the country, includes reconstruction and widening of 24 miles (39 kilometers) of I-15, 59 bridges and 10 interchanges by December 2012. "Building the bridge using accelerated bridge construction eliminated the need for as many as 10 full freeway closures," said Dal Hawks, I-15 CORE project director. "This reduced traffic delays and benefited the state's economy by keeping people, goods and services moving while the bridge was being reconstructed." Utah DOT's first use of SPMTs was on a 2007 Highways for LIFE project in which it removed and replaced a bridge over I-215 in Salt Lake City in one weekend. The Sam White Bridge move was the agency's 23rd using SPMTs, nearly double the number moved by all other states combined. Seven other states have used SPMT technology on bridge projects, including Florida, Illinois, Louisiana, Massachusetts, New York, Rhode Island and Washington. To learn more about Utah's I-15 CORE project, go to https://www.udot.utah.gov/main/uconowner.gf?n=14136825147572377. For more information on SPMTS, visit www.fhwa.dot.gov/bridge/abc/spmts.cfm. 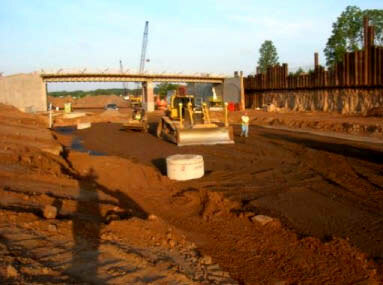 Using full road closure and other innovations helped the Minnesota Department of Transportation reconstruct part of an urban freeway in North St. Paul, Minn., safely and more than a year faster than traditional methods, according to a Federal Highway Administration report on the Highways for LIFE demonstration project. The experience the highway agency gained from using innovation on the project, which involved rebuilding a 2-mile (3.2 kilometer) section of a commuter route to improve safety and travel efficiency, "will be a valuable asset to draw from on future projects," concluded the report, Minnesota Demonstration Project: Reconstruction of Trunk Highway 36 in North St. Paul. Intelligent compaction rollers and lightweight deflectometers were used on the project to improve the quality of grading operations. A locked incentive date in the contract motivated the contractor to finish the project early. A+B, or cost-plus-time, contract bidding reduced contracting time. Lane rental fees on lanes that the contractor needed to close before or after the full road closure for maintenance or cleanup kept motorist impact to a minimum. An intelligent transportation system allowed the Minnesota DOT to monitor traffic on detour routes around the construction. The Minnesota Highways for LIFE project included construction of a pedestrian bridge over TH 36 to enhance safety. Innovation helped the project meet Highways for LIFE performance goals for safety. The full road closure eliminated traffic—and motorist-related incidents—in the work zone. No worker injuries were reported either. In the first year after construction, injuries and fatalities were down 40 percent, compared to the three-year average before the project started. That trend is expected to continue because the project eliminated six at-grade intersections, making it a safer corridor. Using full road closure and innovative contracting allowed the contractor to reopen TH 36 in just 6.5 months, 65 percent sooner than the 19 months required for traditional methods. That exceeded the Highways for LIFE goal of 50 percent reduction in traffic impact. The smoothness and tire-pavement noise quality measurements for the completed highway were slightly higher than the goals set for the Highways for LIFE program, although smoothness improved from the preconstruction level. A Minnesota DOT survey indicated overwhelming approval of the way the project was executed, exceeding the goal of achieving 80 percent satisfaction with the method used to minimize traffic disruption. Nine out of 10 residents and commuters were positive about the project approach, while 83 percent of local businesses were pleased. Speed of project completion was the most commonly cited reason for positive feelings. An economic analysis found that the Minnesota DOT's innovative approach increased project costs by about $2.1 million, or 7 percent, compared to conventional construction practices. User costs associated with detouring traffic to alternate routes during the full road closure exceeded the savings in construction costs. According to the agency, additional road user costs for traditional construction—including increased delays and motorists' exposure to work zone hazards—would have made that approach cost-prohibitive, so the full road closure approach was the best option. To view the Minnesota and other technical reports on Highways for LIFE demonstration projects, go to www.fhwa.dot.gov/hfl/projects. Value engineering combined with innovative construction materials and traffic management will help the Colorado Department of Transportation enhance safety and minimize motorist impact when it replaces a busy bridge in downtown Denver. The Colorado DOT received a Highways for LIFE grant to use innovation on its project to replace the Interstate 25 Bronco Arch Bridge, which has lived out its useful life. Built in 1951, the steel arch bridge carries more than 200,000 vehicles a day over the South Platte River and through a critical corridor in the city. Although the bridge is listed on the National Register of Historic Places, rehabilitating it carried a high cost and posed a safety risk. The Colorado DOT worked with the State Historic Preservation Office to determine that replacing the bridge is more cost-effective and safer than rehabilitating it. In March 2011, Colorado DOT opened bids on a new bridge. Earlier estimates put the construction cost at $25 million. One of the main construction innovations planned is full-depth precast concrete deck sections. "We required all bidders to bid the full-depth precast deck sections," said Randy Furst, Colorado DOT's Region 6 resident engineer. "We think the precast deck panels may speed up construction by a few weeks in each phase. CDOT does allow consideration of value engineering change proposals after award, but we required the bidders to bid on the plans as designed." The Colorado DOT will use innovative materials and traffic management to lessen the impact on travelers of building the new Bronco Arch Bridge. A value engineering study was conducted by Colorado DOT's Region 1, and two constructability reviews involved both Colorado DOT staff and members of the Colorado Contractors Association. As a result of those reviews, Colorado DOT found that when using innovative construction materials such as full-depth precast panels, many more notes and details are required than for traditional construction materials. And after a constructability review, construction phasing was redesigned to eliminate ramp closures and reduce impacts on a significant number of commuters. The existing bridge has eight through lanes, as will the new one, but because of phasing and the requirement to carry the same number of lanes during construction, the replacement structure could allow for future widening of the interstate. By using a system of five construction phases, the old bridge will be demolished and the new one built in its place. Traffic will first be moved over to the far west side while the far east side is rebuilt. Then traffic will be switched onto the new east side while the west side is rebuilt. Phases 3, 4, and 5 will each consist of rebuilding sections 32 to 43 feet (9.7 to 13.1 meters) wide between the west and east sides. Use the Colorado DOT's Intelligent Traffic System to provide traveler information. Use an e-mail notification system to keep citizens informed about the project. The Colorado DOT Public Relations Office will work with the project engineer and contractor to develop accurate and timely releases of information. Have a project-specific website to update the public on planned closures and detours. Limit lane closures on I-25 to 7 p.m. to 5 a.m. Bridge work will have a minimal impact on the traveling public with the exception of such major operations as girder erection and demolition. Maintain the existing number of lanes over the bridge—four mainline and one acceleration-deceleration lane in each direction—except at night. Maintain a posted speed limit across the bridge of 55 miles per hour (88.5 kilometers per hour). Schedule construction activities around sporting and other major events at nearby event centers so they do not affect traffic. A Federal Highway Administration grant helped turn a research prototype into a marketable device that accurately and rapidly measures aggregate shape characteristics that affect pavement durability and safety. The Aggregate Image Measurement System, or AIMS2, offers an objective method of analyzing aggregates to meet construction specifications, ensure pavement performance and enhance roadway safety. Pine Instrument Co. of Grove City, Pa., the company that developed the AIMS2, envisions it as a useful tool for highway agencies, academic institutions, aggregate suppliers and pavement engineers. The project to incorporate aggregate image analysis technology into a market-ready device is one of eight the Highways for LIFE initiative has funded under its Technology Partnership program, which provides grants to private industry to test promising technologies that enhance highway quality and safety or cut construction congestion. "There was a tremendous benefit from both a time-to-market perspective and the added exposure to the industry that came from working with the Technology Partnership program," said Dave Savage, Pine Instrument sales and marketing director. Research has shown a link between the shape characteristics of aggregates used in hot-mix asphalt and the structural integrity and durability of pavement systems and the skid resistance of pavement surfaces. Methods now used to measure those characteristics—including angularity, form and surface texture—can be time consuming and subjective. The AIMS2 automates aggregate measurement to make the process faster, more objective and more consistent. 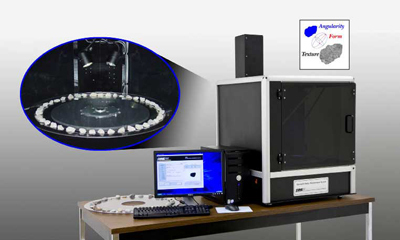 The system combines hardware that captures digital images of aggregate samples and software that analyzes the characteristics of those samples. The device can be set up in a laboratory or moved to other locations to analyze aggregate samples. Transforming the AIMS2 from a research system to a market-ready product was a two-phase process. In the first phase, Pine Instrument reconfigured the components of the prototype's hardware system and enhanced the analysis software. The redesigned prototype went through two rounds of testing and adjustments before moving to the second phase: evaluation by 32 university, commercial and highway agency laboratories. In that phase, designed to establish the repeatability and reproducibility of the AIMS2 methodology, eight AIMS2 devices made the rounds of four labs each, where they were used to test aggregate samples prepared by project partner Texas A&M University. Research has shown a link between aggregate characteristics and pavement performance. The AIMS2 device analyzes aggregate characteristics objectively and accurately. Each lab received an AIMS2 unit, instructions and three material samples: granite, gravel and limestone. The lab set up and checked the calibration of the system and measured each sample twice, on different days, with the same operator. After analyzing data from the labs, Texas A&M concluded that the AIMS2 device provides repeatable and reproducible results for all but the smallest size of aggregate tested, 0.075 millimeters. Additional work is planned to improve system performance on that aggregate size. The study also provided data to develop standard methods for testing aggregate materials with digital imagery. The American Association of State Highway and Transportation Officials approved two proposed test method procedures as provisional standards (TP81 and PP64). The drive for innovative paving technologies has focused greater attention on accurate aggregate characterization. For example, the performance of stone-matrix asphalt—a rut-resistant mixture that relies on stone-to-stone contact to provide durability—is related to aggregate shape properties. And proper aggregate classification is essential when using warm-mix asphalt, which is produced at lower temperatures than traditional hot-mix asphalt. As a result of these industry trends, Pine Instrument officials are seeing interest in the AIMS2 concept at highway agencies and aggregate producers in the United States and abroad. Pine Instrument's marketing strategy includes positioning the AIMS2 as a device that provides objectivity in the characterization of aggregate materials. Among its selling points are the simple operation of the equipment and the accuracy and reliability of the results, compared to methods now used. The company is using several avenues to promote the AIMS2, including direct sales, trade shows and advertising. Interested parties can also apply to the company for the opportunity to try the new technology before making a buying decision. For more information on Technology Partnerships, visit www.fhwa.dot.gov/hfl/partnerships/ or contact Julie Zirlin at Julie.Zirlin@dot.gov or (202) 366-9105. For details on the AIMS2, contact Dave Savage at dsavage@pineinst.com or (724) 458-6391. The Florida Department of Transportation plans to demonstrate an innovative construction method by placing precast concrete panels in a 792-foot-long (241.4-meter-long) section of U.S. 92. The precast section is part of a $13.5 million, 12.6-mile (20.2-kilometer) rehabilitation of the four-lane highway running between Daytona Beach and DeLand. To support the innovation, the Federal Highway Administration gave the Florida DOT a Highways for LIFE grant. Construction began in March 2011 and is expected to wrap up early in 2012. The original project concept consisted of a 2-inch (50.8-millimeter) asphalt interlayer and a 9-inch (228.6 millimeter) concrete pavement overlay over the entire length of the project to minimize flooding of the highway. The plan was to use the speed of precast panels to replace intersections along the project. The panels would have been placed at night to minimize traffic disruption, said Robert C. Schmitt, District 5 materials and research engineer for the Florida DOT. But the project had a tight budget and a series of drainage studies determined that only a section of the roadway needed to be raised to avoid flooding. FHWA and Florida DOT representatives were updated on the changes to the original project in a meeting, and it was determined that the Highways for LIFE grant would be used to construct a 792-foot-long section using a Florida Modified Texas Precast Slab System. In this modification, special design details ensure complete grout encasement around the post-tensioned strands, minimizing corrosion and increasing expected pavement life. "The demonstration during construction will be used to show contractors and engineers in the Florida area that there are other methods to place concrete pavements," said Schmitt. "If an agency has a very tight schedule, they may want to consider using precast slabs. Contractors can install the prefabricated slabs and open them to traffic more rapidly than conventional concrete paving methods." A 1.7-mile (2.7-kilometer) section of the westbound roadway will be elevated in an area where heavy rainfall overtops the roadway. In a 1.55-mile (2.4-kilometer) portion, the existing concrete pavement will be removed, crushed and reused as a graded recycled aggregate base that will be paved with a new concrete overlay. In the remaining 792 feet of the section, the existing concrete roadway will remain intact. To raise the pavement, 9-inch-thick precast panels will be placed on top of an asphalt interlayer that will overlay the concrete pavement. The asphalt interlayer will correct the crown in the old pavement so that water runs off to the outside of the roadway. "This will be the first time we are aware of that anyone has placed precast panels as an overlay on an existing undisturbed concrete roadway," said Schmitt. The precast section will go down in three segments of about 264 feet (80.4 meters) each. It will require 66 panels, typically 12 feet (3.6 meters) by 24 feet (7.3 meters), to span the 792-foot stretch. The panels are prestressed, and each segment will be post-tensioned longitudinally with tendons running through ducts in the panels.